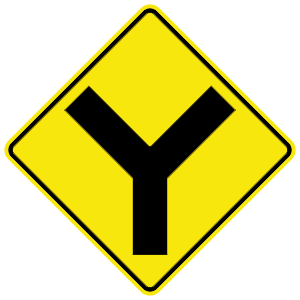 You are traveling in the opposite direction on a two-way roadway that has four or more lanes. You are traveling in a rural area and the road has a large shoulder on each side. You are traveling in the same direction on a two-way roadway that has four or more lanes. The speed limit in the area is under 25 miles per hour. On a two-lane road, all traffic must stop and remain stopped as long as the red lights near the top of a school bus are flashing and/or the stop arm on the left side of the bus is extended. On a highway with two or more lanes traveling in each direction, oncoming traffic is not required to stop when meeting a school bus. Park within 24 inches of the curb or edge of the roadway. Park within 18 inches of the curb or edge of the roadway. Park at an angle with the front of your vehicle facing out. When parking on a public road, you must park parallel to and within 18 inches of the curb or edge of the roadway. Your vehicle should be facing in the same direction as the traffic is moving on your side of the road.